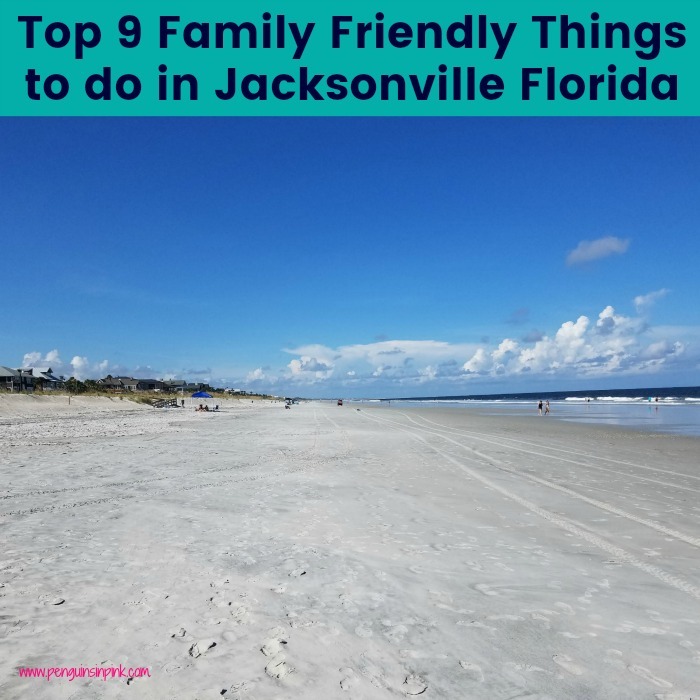 This post, Top 9 Family Friendly Things to do in Jacksonville Florida, may contain affiliate links. This means if you make a purchase through one of these links, Penguins in Pink will receive a commission at no additional cost to you. Jacksonville, Florida is a gorgeous port city full of amazing bridges and history. 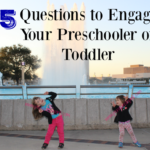 The girls love animals and visiting zoos. A couple years ago, Doodles wanted to see tigers. A little research led us to deciding to visit the zoo in Jacksonville and we fell in love with all Jacksonville has to offer. We have since gone back for other visits. 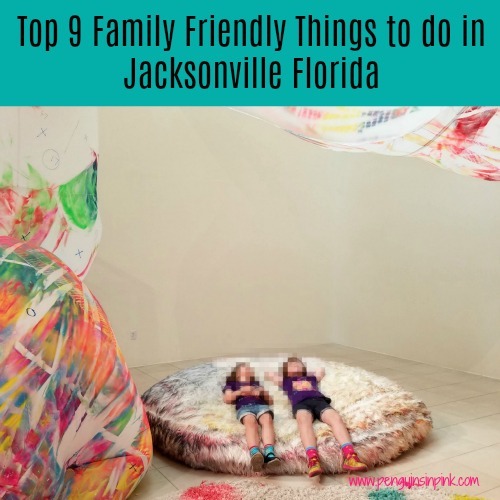 These are our Top 9 Family Friendly Things to do in Jacksonville Florida. 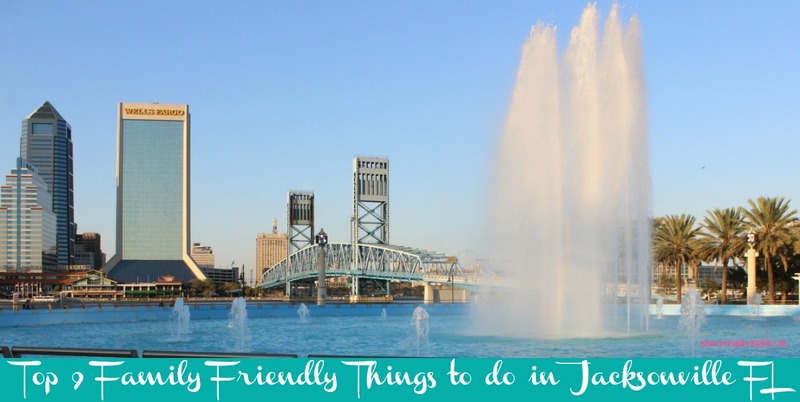 I also included a list of things to do the next time we visit Jacksonville, Florida. Jacksonville Zoo and Gardens – The Jacksonville Zoo and Gardens is an awesome 73 acre zoo with more than 2,000 rare and exotic animals and 1,000 varieties of plants. The tiger exhibit is amazing and a must see. It was quite a shock to walk under a “tree” and see a tiger laying in it! 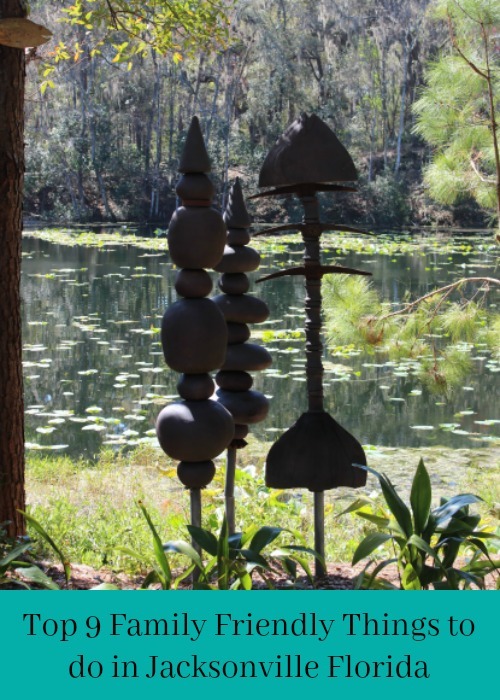 The Cummer Museum of Art and Gardens – The Cummer Museum is absolutely lovely and is home to about 5,000 pieces of artwork in its permanent collection. The 2.5 acre historic garden overlooking the St. Johns River is stunning. The children’s hands on section is superb and tons of fun for kids. Catty Shack Ranch Wildlife Sanctuary – Catty Shack Ranch Wildlife Sanctuary is a non-profit, forever home for endangered big cats, and educational facility. The sanctuary offers night tours filled with education and stories about the residents and a exciting feeding time. Hearing the growls, roars, moaning, and purring of the lions, tigers, cougars, leopards, and other residents was very thrilling. The kiddos and adults enjoyed it immensely. Jacksonville Arboreteum & Gardens – Take a hike on over 3 miles of trails at this 120 acre woodland. The trails circle the two-acre lake and have over 100 labeled plants. Museum of Science and History – The MOSH has a variety of exhibits like Health in Motion and J.E.A. Powerplay. A couple of animal and plant centers that focus on Northeast Florida. The Currents of Time exhibit and planetarium are very fascinating. Friendship Fountain – Friendship Fountain is right next to the Museum of Science and History and seated next to the St. John’s River. The fountain is just gorgeous, very well maintained, clean, and scenic. Great photo opportunities and an excellent river walk. Tree Hill Nature Center – 50 acres of nature preservation with several walking trails, a hands-on kids museum featuring Florida’s natural history, butterfly and hummingbird gardens, a seasonal live butterfly exhibit, and a variety of other animals. Museum of Contemporary Art Jacksonville – Most of the art at MOCA Jacksonville is from 1960 to the present and is home to nearly 1,000 pieces of art in it’s permanent collection. It is smaller than I expected but nice nonetheless. Atlantic Beach is great for wide, sandy, open beach and makes for an excellent beach trip. The girls loved hunting for shells and playing in the waves. These four additional places on our list to explore the next time we visit Jacksonville. Jacksonville-Baldwin Rail Trail – 14.5 miles of asphalt trails for hikers, bikers, and equestrians. Timucuan Ecological & Historical Preserve – The Timucuan Preserve contains 5 parks and preserves. Fort Caroline offers hiking along with history of 16th century French presence in Florida. Kingsley Plantation is a slave plantation from the 18th and 19th century. American Beach is 8.5 acre sand dune the beach was founded in 1935 as a part of racial segregation. Cedar Point is a nature preserve that contains hiking trails, boat ramps, and fishing. Theodore Roosevelt Area is a 600-acre hardwood forest, wetlands, and scrub vegetation. Talbot Islands State Parks – There are 7 state parks Big Talbot Island, Little Talbot Island, Pumpkin Hill Creek Preserve State Park, Amelia Island, Fort George Island Cultural, Yellow Bluff Fort Historic, and George Crady Bridge Fishing Pier. Jacksonville Beach is also beautiful and has lots seashells to hunt for during the beach adventure. 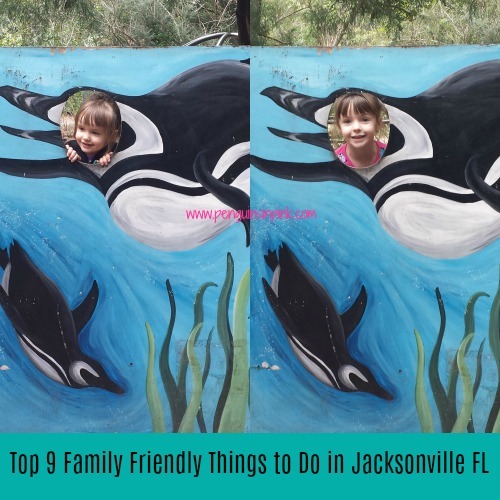 These are our Top 10 Family Friendly Things to do in Jacksonville Florida with 3 bonus places we want to visit the next time we are there. Have you been to Jacksonville, FL? What’s your family’s favorite thing to do there? 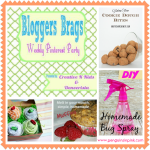 Looking for more fun travel ideas and tips? 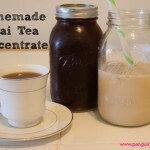 Check out my Travel: Oh the Places We’ll Go board on Pinterest.